David Gilliland won practice in the second of two sessions for the Grand National division teams of the NASCAR Busch North Series and NASCAR West Series. He didn’t stick around very long to relish in his accomplishment though. Immediately after the second practice session Gilliland left the track to head to Phoenix, Arizona where the NASCAR Busch Series is in action this weekend. “We’ve got a busy couple of days ahead of us. I’m going to go now and practice the Busch car tomorrow at Phoenix. I’m going to be racing the Busch race [at Phoenix] on the same day as the Showdown. Gilliland will be driving at Phoenix for car owner Clay Andrews and the Andrews Racing team. 29-year-old Gilliland is considered a rising star in racing, so this weekend’s hectic schedule could pay off big in the future. As he left the Irwindale track, Gilliland was happy with the handling of his #88 car. Things didn’t exact go according to plan for Busch North Series driver Ryan Moore on Thursday, but the young driver and his team took a practice crash in stride and posted some respectable numbers in the next practice session. Moore backed his #74 into the wall during the first practice session after getting crowded by Dale Shaw. It took less than 10 minutes for Moore’s team to unload their back-up car and they were eighth quickest in the second practice session. You can’t get much further away from two points in the continental United States than New England and Southern California. That’s why several Busch North Series teams doubled up to get to California. David Gilliland brings his #88 in after practice. Moore and his team obviously did a good job, but that wasn’t due to getting much practice of dealing with a back-up machine. The Elite Series side of the pit area at Irwindale looked a little bare on Thursday. That’s because that series had their season finale on Thursday afternoon at Phoenix International Raceway. Teams will truck through the night and sign in to the Irwindale pit area on Friday morning. Several Southeast Series teams decided to double dip as well. Jeff Fultz, J.R. Norris, Dusty Williams and Greg Pope all raced at Phoenix. Also making a pit stop in Phoenix before going to Irwindale was Midwest Series driver Tim Schendel. Midwest Series champion Justin Diercks topped the speed charts in the second Elite Series practice session – and he wasn’t even in the best position to set the fastest lap. Diercks is careful to read too much into his performance though since so many top Elite division teams were AWOL on Thursday and racing at Phoenix instead. Harr ran into a problem in the first practice session, but recovered to post the 23rd quickest lap in the second session for the Grand National teams. serving as the Grizco Racing headquarters for the weekend. The dually pick-up and trailer that usually hauls Brad Leighton’s car made the trip West with a back-up machine in the event that Santerre or Stefanik need one. One of the drivers missing from the Showdown is the top Southeast Series rookie, Gary Helton. The Tennessee driver was injured in a four-wheeler accident and reportedly broke his collarbone. His absence set up some fancy footwork for the competitors of the Southeast Series. Originally, Jason Hogan, Dusty Williams and Allen Karnes turned down their invitations to the Showdown, putting Chris Davidson, Terry McMahan and Eddie Stivers in the show. 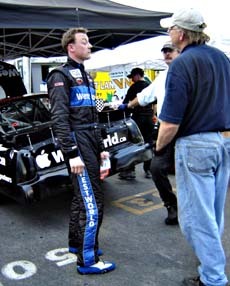 Williams had declined to run the Busch Series race at Phoenix, but when that deal fell through, he reconsidered and entered the Showdown as a substitute for Helton. The NASCAR Toyota All-Star Showdown features some of the best short track racers from all across the United States – and one from Canada. 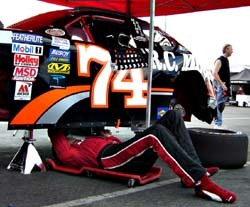 Daryl Harr and his #71 team compete in the NASCAR West Series out of Alberta, Canada. Just getting to the track every week is quite an accomplishment for the team. “It was about a four-day drive, but we’ve done it about 15 times before this season and lots more the years before,” said Harr. “It’s become the norm. Our closest race is 14 hours away and our furthest is Texas, which is just over 45 hours away. This one is in the middle. It’s between 33 and 36. Last weekend, Midwest Series competitor Eddie Hoffman was in Nashville, taking part in the All-American 400. This weekend, he’s out in California competing at Irwindale. It’s been a very busy week for his team, but Hoffman said his team was up to the challenging schedule. Hoffman was fourth quickest in the second practice session for the Elite teams. Sean Caisse and his Barney McRae-owned #5 team sent their racecar out West on the hauler of Jerry Morello’s #77 team with driver Eddie MacDonald. Kip Stockwell’s car hitched a ride with the Mark Willoughby-owned team that Dale Shaw drives for and John Salemi’s racecar rode along with Jeff Anton’s #30 team to California. Ryan Moore goes to work to switch parts from his wrecked car to his back-up car. 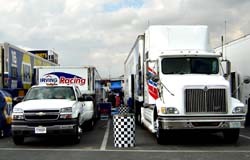 The haulers of Grizco at Irwindale. Eddie Hoffman and his team. Justin Diercks unwinds after practice is finished.